Marine officials have retrieved 13 more bodies inside the sunken South Korean 'Sewol' ferry bringing the death toll to 50. The arrival of the dead bodies corresponds with the South Korean coast guard's announcement. The number of those unaccounted for stood at 252 early Sunday. The search and rescue team has now turned into an attempt to recover more than 200 bodies - many of them children - from the wreck of the ferry that capsized on Wednesday morning. South Korean officials said Saturday they are sending in 176 ships, 28 aircraft and 652 divers to take part in the search and rescue efforts. Updated reports said that at least 256 people are missing after the Sewol sank off South Korea's southern coast with 476 people on board. 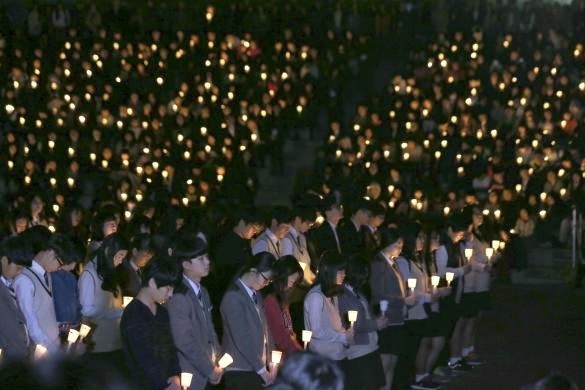 The tragedy is now called the South Korea's deadliest maritime accident in 21 years. Some reports say that the ferry, on a 400-km voyage from the mainland port of Incheon to the Korean resort island of Jeju, may have turned sharply and then listed before capsizing. Reuters reported that the three crew members, including the 69-year-old captain, were arrested on Saturday and charged with crimes relating to negligence. Senior prosecutor ang Jung-jin told reporters that the captain has abandoned people in need of help and rescue and "escaped before the passengers."